A beautiful Monday it is…and we are glad to finally have Chinedu Achebe here on African Stories. Author of Blunted on Reality now available for Free, He talks about the difference between true love and real love, what being black is all about and his love for writing in his interview with African Stories. In his book, Blunted on Reality, Chinedu uses a style of writing that ‘engages’ his audience and gives insightful political positions surrounding the 2009 Obama’s election. Never one to ignore ‘the love ingredient’ in his book, Chinedu spices up his book with a little love triangle… Get a free copy. Read his interview. Q. Who is Chinedu Achebe really? A. Lol. That is a very good question. I am just a very chill, laid back guy that is trying to just enjoy my life. Q. At what point did you pick up your pen? A clear call or a hobby? A. I started writing seriously about 5 years ago. I tried to start a blog, but after writing a couple of posts I decided to go in another direction. It wasn’t until after the 2008 presidential election victory of Barack Obama that I decided to write a book. Q. What is your writing formula? A freestyler or traditionalist? A. My writing formula consists of a little bit of both. I usually have the main ideas that I want to discuss in the book. But after that I do a lot of free styling from chapter to chapter. Q. Would you say writing is 98% perspiration and 2% inspiration? What really should be an African writer’s ideal writing mix? A. I would disagree with that notion. In my case the inspiration is about 40% and perspiration is 60%. In my opinion, you have to have a reason to want to write a book. Q. In your book “Blunted on Reality”, you made mention of the difference between being an African and a black American, is there really a difference? An ideology perhaps? A. I feel there is a difference but you have to throw in a person like myself who was born by two Nigerian parents, but was born and raised in the United States into the mix as well. People like myself are in the middle because we can relate to Africans along with black Americans. The differences are usually just cultural, but it is funny that both African and black Americans share some traits as well. 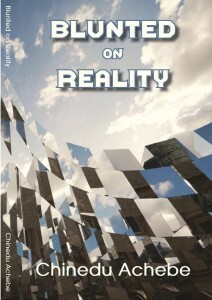 Q. Obama at the time of writing “Blunted on Reality” was a common denominator; do you think that is still the case? A. I don’t think he would be the common denominator as was the case in 2008 and 2009. But Obama would still help shape my story. Q. If you were to write “Blunted on Reality” today, what will change? A. That is a hard question to answer because timing is everything. When I started writing Blunted on Reality in 2011, I was 29 years old. Now I am 32 years old. In those three years I have experienced different things in my personal, family, and professional life that have shaped me. Q. Your style of writing exudes a distinct trait stemming from black Americananism – “meaning to write as if one were living in the hood”. To what extent do you think environment affects a writer’s style of writing? A. I feel that environment plays a huge role on your perspective of things. It helps shape are thoughts and views. Q. Nigeria’s Nollywood singlehandedly redefined movie making and marketing in the region, making it one of the biggest movie industries. What in your opinion should be done about publishing in African countries to attain same success story? A. Younger African authors need to find their voice and tell the story of their generation. Nollywood does a great job of making movies that appeal to various ages. The movies that I watch aren’t the same as the ones my parents would watch. But we also have to be aware to not confine African authors just to the continent. There are Africans in Europe, Canada, and the United States telling their stories as well. Q. If there was any reason to reshuffle roots, where would you rather have yours? Any particular reason? A. I wouldn’t change anything. I have a lot of pride in being a Nigerian of Igbo descent. But I can’t dismiss the influence that being born in the U.S. exposed me to black culture beyond the music and tv, which people outside of this country associate it to. I have been able to learn and understand the history of black people in this country and also see their struggles as my struggles. Q. Your first read was? Your favorite authors are? A. I don’t remember the first book that I read. But the book that influenced me was Chinua Achebe’s No Longer At Ease. My favorite authors are Chinua Achebe, Chimamanda Adichie, and Michael Eric Dyson. Q. What are you working on now? Tell us all about it. A. I am currently working on the sequel to my first book, Blunted on Reality. I hope to have it finished by the end of this year or early 2015. I am really excited about it. Q. Upcoming African authors you are aware of are? Q. Social media and self-publishing – ebooks, Twitter, Facebook, Amazon….the works – has played a great role in the rise of number of writers on the continent; almost as if having a writer’s bio validates existence. Is this a good trend? A ‘dawn-phase’ before publishing in Africa witnesses a rebirth or the classic case of the good old bandwagon ride? A. I feel that social media plays a huge role in writing now. You have to be on Twitter and Facebook at the minimum. Self-publishing is great because it allows people to write their own stories without waiting for the traditional publishers to anoint your book with their “holy water”. I have met so many authors who are writing amazing stories. It is a great thing for the continent, because Africans can now reach other all of the globe. Q. Love, Responsibility and Purpose feature in your book. What is your personal take on these? A believer in true love? A. I think those are three things that most of are searching for in our lives. The hard part is that they all come to us at different phases of our lives. I don’t believe in true love, I do believe in real love. I feel that loving someone is very hard and is something that you have to really work on. Q. Hobbies, Awards, Humanitarian works? A. I love watching basketball and American football. I enjoy hanging out with friends and just discussing all types of topics from politics to tv shows. And that wraps it up guys! Hope you had an exciting read. Want to know more about African authors right here? Simply comment below stating the names of favorite writers and the questions you want asked and we will make it happen. All Fun and Games by Tomi Adesina will be posted tomorrow. Beautiful Strangers by Tomi Adesina on Friday. Read Stories. Share Love Stories. In my quest for how best Unen Ameji writers can sell their works, I met Alana Munro-The Author That Supports Authors. Her debut book? A bestseller! 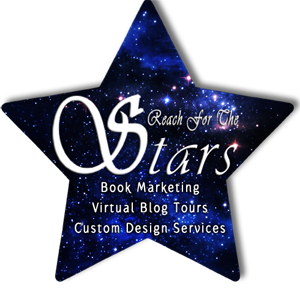 Book Marketer/owner of Reach for the Stars – a quality yet affordable book marketing service ran by authors for authors. Talk about finding answers in unexpected places. Hehehe. I had to get in touch with her. I did and it was awesome! In this short exclusive interview with interesting and easy-going Alana, Alana answers top 11 questions and tells of the right mix to becoming a bestseller! 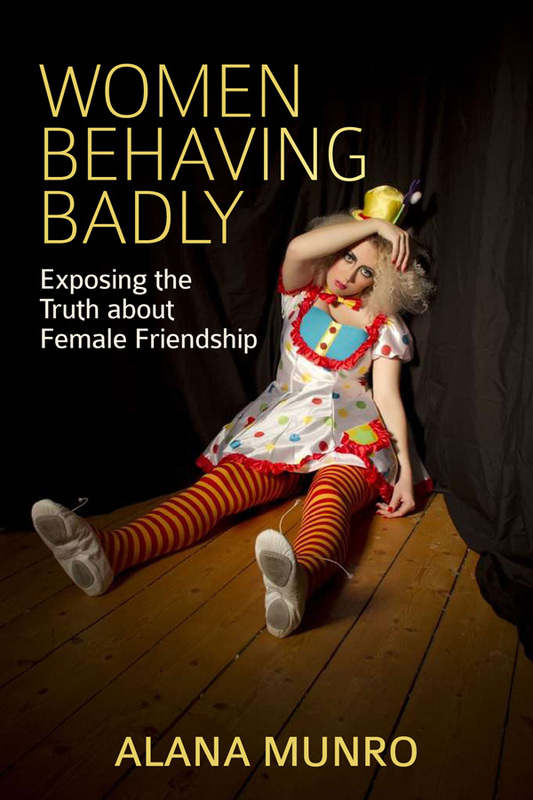 Q: “WOMEN BEHAVING BADLY – EXPOSING THE TRUTH ABOUT FEMALE FRIENDSHIP” is a catchy title? What inspired it? Thank you, I thought it summed up exactly what my book was about. I wanted to talk openly about how some women behave with other women. I had experienced so many toxic women in my life and I felt there needed to be a book available that at least tried to understand the complicated nature of female relationships. Sadly, not all women are nurturing and supportive of each other. Q: What is the message? Did you envisage the number of response you got when you published it? The book is a straight-talking account of my own personal experiences with females throughout my life so far. The book focuses on the common toxic behaviours that can go on between women. I spend a lot of time revealing my own painful and shocking experiences and analysing the negative behaviours. Why do some women behave so badly with their female friends? What’s really going on? What is motivating these toxic women? I also show the reader how it is possible to have healthier and happier friendships with women. I was unsure how the book would be received. I of course feared women becoming angry and defensive. The book is not attacking women though, it encourages women to look honesty at their relationships with each other. We deserve to feel happy and safe in our friendships. It was amazing to read many emails from women thanking me for being honest about how bad it can get between women sometimes. Many women felt relieved that they were not alone anymore. Q: In your opinion, what key factors must writers employ in putting together a bestselling book? It is essential that authors write about something they are passionate about. If you are bored writing your book, expect the reader to also feel bored. It is also important that authors hire someone who is qualified in editing. I thought I had found all my mistakes, but after I allowed an editor near my manuscript I discovered I had missed about twenty! It’s amazing what you miss as a writer. And never ever ignore the importance of marketing. Target potential readers directly and get your book noticed. Too many authors write a book and then wonder why no one buys their book. It is exhausting and constant – but authors need to be good at marketing and tapping into buyer markets. Q: As a self-publisher, what are your greatest challenges? What are the perks? The greatest challenge is having to do everything. The do-it list can be mind blowing! I had lists all over my house at one point. If you have the funds, you can hire people to do most jobs. On the plus side, you learn so much just publishing one book. You rely on yourself and discover so much about the art of publishing books. The perks are the control authors have over their own work. But you have to ensure your work is good quality – too many indie authors get lazy and it gives us a bad name. For example, too many indie authors don’t bother to properly format their E-books. Q: How best does a self-publisher edit work and market it? I hire a professional to edit my work. It’s best to let another pair of eyes look through and highlight the mistakes often missed! 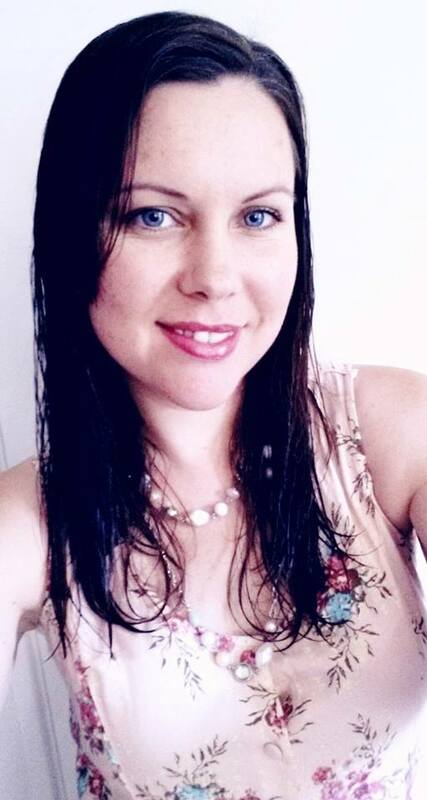 I market mostly via my blog – http://alanamunroauthor.com/ and through my social media networks. I am working on a few different book ideas but at the moment I am mostly busy with my book marketing business. Q: Tell us more about your book tour/marketing platform-Reach For The Stars? How does it benefit African Writers? I am now offering affordable book marketing for all authors from all around the world. I offer services to help authors obtain quality book reviews, blog tours, book blasts, cover reveals etc. I know how expensive and constant marketing can be. I have been there and done it already! I have a marketing and business degree and the personal experience of making my own book a success. Q: If you were to speak to upcoming writers, what would be your opening and closing statements? Keep on writing! Anyone who achieved anything had to work very hard at it. Build connections with other like-minded people. 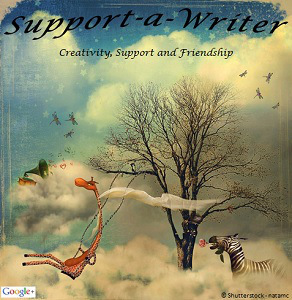 Writers need emotional support from other writers. Q: What do you do for fun? How best do you get refreshed for new inspiration? I love to chill out with my family, watch a funny movie, drink some red wine. I enjoy the simple pleasures of life. I also enjoy some quiet time alone to reflect and refresh myself. Q: Your best artiste? Holiday spot? Food? I love Spain. I have stayed inland, away from the busier coastal resorts and it was amazing. I am addicted to cheese. If only I could live on it alone with some olives, pasta, breads and avocado but I suspect my tummy would grow too big! Q: Where do you see Alana in next five years? I’d like to have another book released, keep working on my busy blog, work on more creative projects and continue to market authors. Thank you Alana. I know we have more to do on getting Nigerian African Authors the platform to becoming bestsellers and reaching a larger audience. So the first time I ‘meet’ Gathinja, she smiling at me from a picture. Yes, you guessed right. The picture above. And then I send her an email immediately because I stole some beautiful paintings from her exotic collections alias True African Art gallery and had to report my theft. (And yes, I take copyrights and permissions seriously. You should too). I found an artist and a friend. A warm and attentive woman with a heart for Art, Gathinja is not just an artist but an intelligent and shrewd business woman (She knows what I am talking about.lols) and while there was no “Jambo na karibu!” – meaning Hello and welcome in Swahili, we did hit it off. The rest is history they say. I met a beautiful spirit and I would like you all to meet her. A tour of her site would do any art lover good as it feels like an exhibition of………okay, I am going to stop now. Unen: Can you please tell us a bit about yourself? My name is Gathinja Yamokoski. 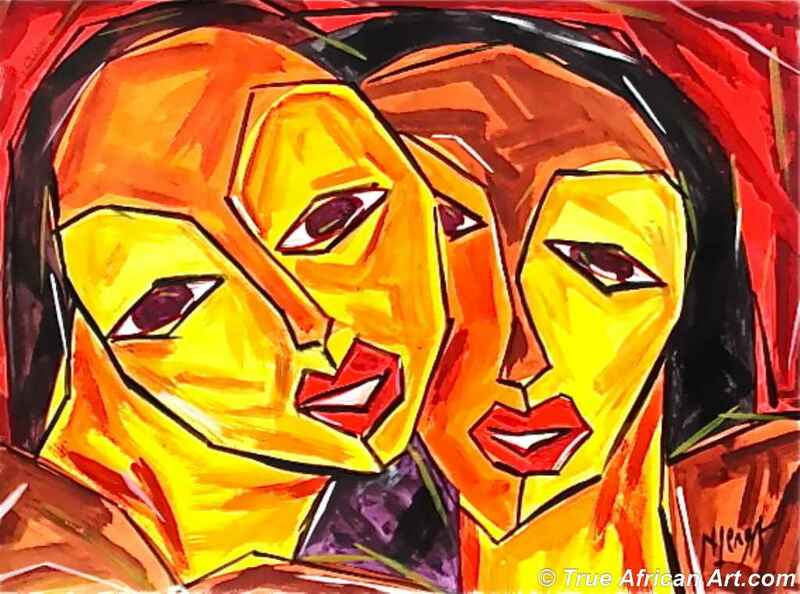 I am the owner of True African Art .Com, an online gallery featuring hundreds of original African art paintings for sale by 60 African Artists. I was born and raised in Nairobi, the capital city of Kenya, East Africa. I have close ties to my country and family. My last name, “Yamokoski” comes from my American husband who I married in 2002 after he lived and worked in Kenya in 2000-2001. Despite living in New York since 2002, I have travelled back to Africa for about a month almost every year to visit my family, friends, and artists. Keeping in touch with my homeland is very important to me as I love Kenya. I have also found solace and enlightenment in the diversity in the United States. I admire that diversity greatly. 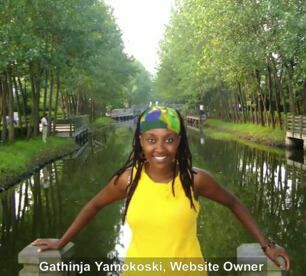 More About GATHINJA YAMOKOSKI and her works. Unen: What is your definition of African Art? 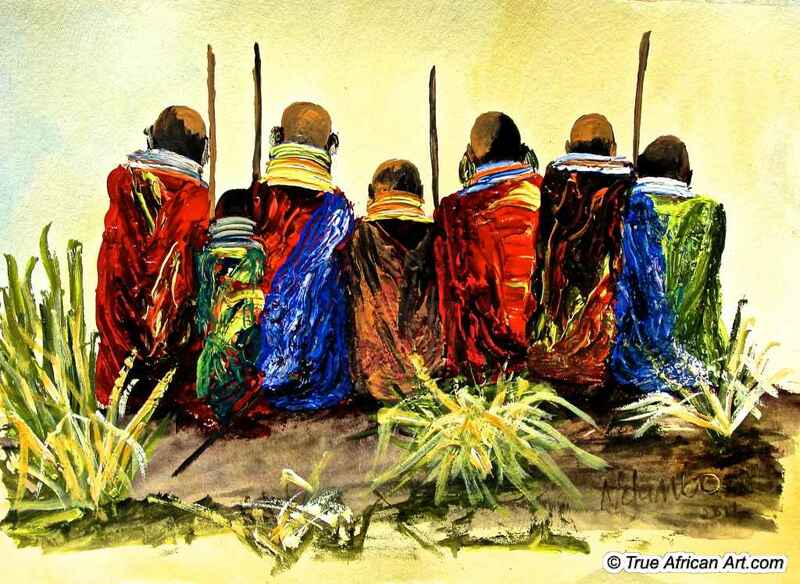 I would have to say that African Art is a direct reflection of the cultures found within. I have curated literally thousands of paintings, and many of them contain the theme of working African women. I take that as an expression of the African woman as being the backbone of the African continent, working hard to ensure her family’s needs and wants are met. 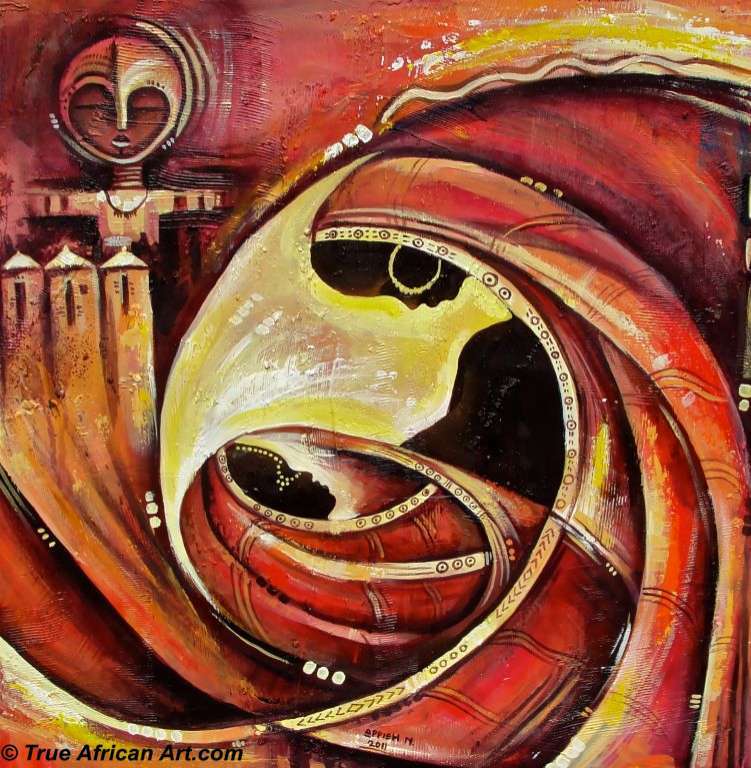 African art is also very abstract at times, with vibrant colors in much of its work. When asking the artists what they are trying to portray through the colors, many of them say they are showing the positive side of life in Africa and are trying to portray exuberant feelings of happiness for the person viewing their artwork. Unen: Do tell us about True African Art. What inspired it? True African Art was inspired by an online void of a solid, well designed website that puts its artists first. We pay our artists well for their work. In return, we do not exploit their pricing when compared to the rest of the art world. Our prices are much lower in comparison. We back this up with a Lowest Price Guarantee . We still have a lot of ideas for an even more deserving website. Now we are most often the online choice for original African paintings because of the keen and caring support for our clients questions, purchasing options, and timely, free worldwide delivery process. 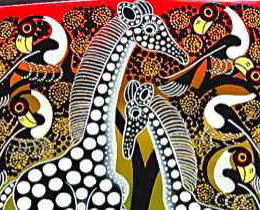 Currently, True African Art is the leading online gallery for buying original African paintings. We’ve had about 1,500 paintings come through our gallery in just over a few years. From those, only a few hundred remain, the rest have sold This includes many copies of Kenya’s Blue Rhino Map prints and small, original painting postcards from Ghana and Kenya. 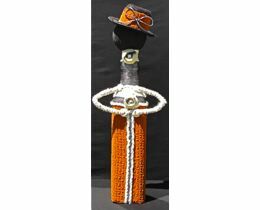 You can read about philosophy of selling African artwork here and about the website through our Home Page. Unen: Prior to launching True African Art. Com in 2009, what art projects were you involved in? As an artist, back in Kenya, I would tailor clothes for my mom and my friends. When I was dating my now husband, I would make art as gifts for him almost every week. So I was always making and looking at art. 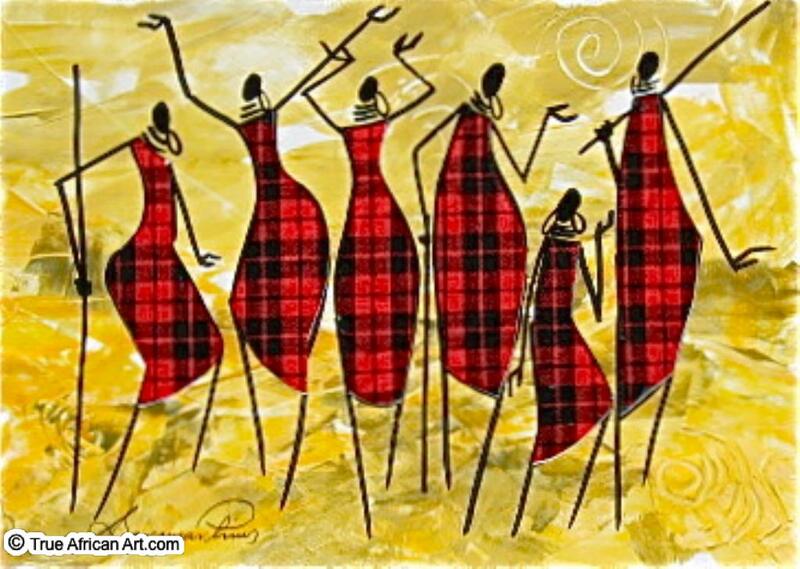 After moving to the USA, I kept making art and knew another Kenyan-American couple who gave me the opportunity to work with selling African paintings online and I excelled at that. I am grateful for that role. Unfortunately, the ideas I had to better their website were turned down multiple times. I had so much enthusiasm and belief that the ideas would work! They were still denied. So I was encouraged by the owner to start my own website. I took his advice and am glad I did! Unen: What was the response like when first launched True African Art. Com? Well, we got our first sale in just about 1 week after opening the site. At the time it was at a very different design, but fully functional. Soon after we had other artists contacting us to be on the site. 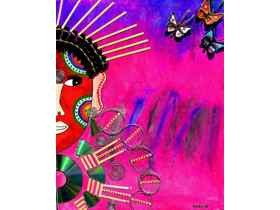 Unen: Is there criteria for becoming an artist on True African Art. Com? What are they? Our records show that we’ve had 87 African artists submit their art to be on our website, but only 20 of those had the quality and communication skills required for such an international relationship. We need to know that the artist is not only a very skilled artist whose work is different than others, but also that they are timely in delivering paintings to us and answer our calls and texts appropriately. Also, we can’t buy from everyone all the time. So we often have to tell prospective artists to wait until we are ready to buy more stock. If they are already on the website and they ask us to buy more paintings from them, we sometimes have to wait until their stock depletes more. We have artists from Africa whom we have returned to five times over, while others whom we have bought from, none or only a few of their paintings have sold so we have to have them wait until their stock depletes more before we buy more paintings from them. To see what we officially require from artists, it’s all on the True African Art .Com here. Unen: I suppose a major challenge is in the distribution of purchased works. What channels have you put in place for worldwide delivery and how efficient are they? Actually, it is very easy. 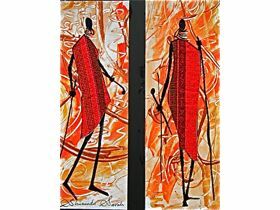 For an African painting for sale that a client wants to buy, they just click the “Add to Cart” button found underneath the painting. This takes them to True African Art’s online shopping cart where they confirm their delivery options. Then, on the next page, the secure Checkout Page, they enter their contact information. They can choose to enter their financial information directly through a credit card or through Pay Pal. For Pay Pal, the Internet’s secure standard for online purchases, a client does not even need to be a member or sign up to use it, they can use it just as a Guest. Either method does not show us their credit card details, but instead, just passes along their payment and shipping address. From there we professionally pack their African paintings, take them to the Post Office, get insurance on the package and then within a week the client receives their artwork. Internationally, packages arrive in about 2 weeks, more or less. The Post Office has never lost a painting or damaged a package. If a customer requests it, they can employ DHL, Fed Ex, or UPS, but they have to pay the carrier costs for those packages. We do not profit from those costs and rarely are they requested as the US Postal Service we offer is at no cost to the client, whether ordering from inside or outside the USA. Unen: Where do you see True African Art. Com in the next 10 years? With more staff, more artists, more clients, and more experience to continue delivering the best of service and the best of African art for sale. Unen: What is your favorite pastime? I like to spend time with my husband, watch TV, read, and talk to friends, family, and artists. I am drawn to anything African! Unen: What is your take on the commercialization of Art as it experienced now? Is art still the message or is it about how fast it sells? Well, everyone likes a sale! But what sells is what counts. Are you selling cartoon paintings that will fade over time or are you selling quality work that in the next 100 years, someone will look at it and say, “Wow, where did this painting come from? 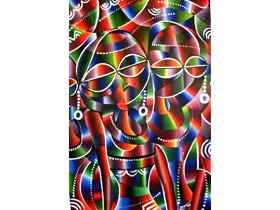 !” We’d like those paintings to come from True African Art. The art you are currently seeing coming from us and in the future is taking a major shift from commercial art to more collectibles that are harder to find and easier to appreciate. Unen: How best do we change Africa through Art? By keeping the message positive. When art is recognized as something that is joyful and not a sad or controversial theme, then it will continue to reflect the momentum of the continent as being a positive force in the world in the face of poverty, disease, and war. True African Art is a platform that stands for this and the faith and love we have for our brothers and sisters in Mama Africa and around the world. Unen: Thank you for your time Gathinja. We hope to have you here again and very soon too. 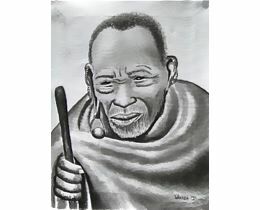 For more information on how you can be a True African Artist or get works, visit True African Art .Com.